"Mission Accomplished" and a polished, packaged war. Now, even his former press secretary has turned on him. Five years ago, the GOP had Dems running scared. Dems have won the house & prepare to win more. for the Dem nomination, & Dean was the insurgent. and Barack & Hillary are the party's national figures. 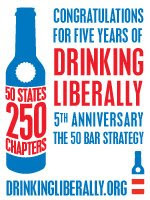 but one thing remains constant: DRINKING LIBERALLY. now in 250 chapters all across the nation. for a more progressive America.